Omaha Police on Wednesday released the names of officers involved in — and the official timeline of — the events leading up to the shooting of an officer and suspect Tuesday afternoon in North Omaha . OPD Officer Ken Fortune, 42, an officer with the department for nearly 11 years who has been with the gang unit since 2011; he was shot in the shoulder during the incident . He was admitted to UNMC with a non-life-threatening injury and is scheduled for surgery, according to the OPD statement. Two men were arrested: Brandon Richey, 28; and John Ezell Jr., 36. Ezell was also admitted to UNMC with non-life-threatening injuries following Tuesday's shooting. Upon his release from the hospital, he will be booked on two counts of attempted murder, possession of a firearm by a prohibited person, and two counts of use of a weapon to commit a felony, according to the OPD release. Richey will be charged with accessory to a felony and felony flight to avoid arrest, the release states. OPD also identified two other officers involved in the incident: Christopher Brown, 28, has been with the department since 2006 and with the gang unit since 2010; and Jeffrey Wasmund, 38, has been with the department since 2005 and with the gang unit since 2011. All three officers have been placed on administrative leave, according to the OPD statement. All three officers had body cameras that activated at the time of the incident; audio was also captured by ShotSpotter. Video evidence, 911 audio, and available witness statements indicate the officers' use of deadly force was "in accordance with their training"; however, the incident remains under official investigation by the department with the assistant of the Nebraska State Patrol, the report states. OPD Chief Todd Schmaderer said in the statement that body camera footage clearly supported the officers' use of force. "September 11th is a trying day for Law Enforcement and the Omaha Police Department in particular," he said. "On September 11, 2003, Sergeant Jason Pratt was shot (and died days later) in the line of duty; on September 11, 2018 Officer Ken Fortune was shot in the line of duty, we are fortunate he appears to be recovering from his wound as it could have been much worse." At the time of the incident, all three Gang Unit Officers were wearing plain clothes and a black tactical vest with an Omaha Police Badge on the front, and the words POLICE GANG UNIT clearly marked on the back of the vest, the release states. The officers were driving a black unmarked police vehicle that was equipped with a police siren and red/blue police lights mounted on the visor. Body Worn Camera footage shows the officers initiated a traffic stop by turning on the red/blue lights and the vehicle stop. The driver of the vehicle, identified as Brandon Richey, accelerated away as the officers walked towards them. The officers returned to their vehicle, followed the suspect vehicle and attempted to stop the vehicle again. The red/blue lights were still flashing, and the officers sounded the police siren four different times in an attempt to get the vehicle to stop. Richey stopped for the red light on Laurel Street at 30th Street. Officer Ken Fortune, the front passenger officer, got out of the police car and attempted to place Stop Sticks underneath the rear tire in an attempt to prevent the vehicle from driving away again. This attempt missed, and the vehicle turned north on to 30th Street, stopping approximately two car lengths from the corner of 30th & Laurel Streets. Officer Fortune picked up the Stop Stick and ran to the stopped vehicle and placed it underneath the front passenger tire. Just as Officer Fortune turned to address the passenger, later identified as John Ezell Jr, the passenger door opened and Ezell pointed a handgun at Officer Fortune as Ezell said "What’s going on?" Ezell immediately fired at Officer Fortune, striking him in his radio microphone, with the round traveling through the microphone and into his shoulder (see still photo). Officer Fortune fell to the ground. 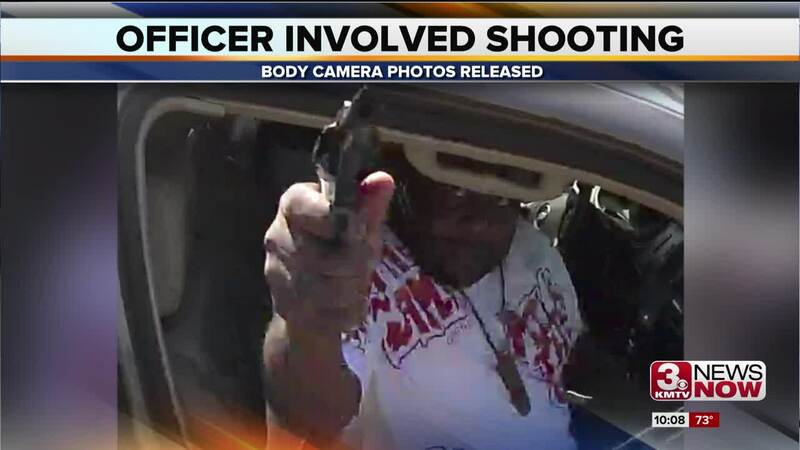 Body Worn Camera footage shows Ezell exit the car and extend his right arm horizontally and fire in the direction of Officer Wasmund, who was along the passenger side of the police vehicle. Officer Wasmund was not hit. As Ezell was shooting at Officer Wasmund, Officers Brown and Wasmund returned fire at Ezell. Ezell fired his weapon at least two times. Ezell then ran eastbound along the north side of 5901 N. 30th Street. Officer Brown fired his duty weapon, a .45-caliber Glock, five times; Officer Wasmund fired his duty weapon, a 9mm Glock, two times. Officer Fortune was unable to return fire. Ezell was struck multiple times, fell to the ground, and was subsequently placed into handcuffs. The Officers located a .38 revolver within approximately three-yards of where Ezell was handcuffed. Officer Fortune was able to get up and address Richey, who had gotten out of the vehicle with his hands in the air. Even though he was injured, Fortune was able to handcuff Richey without further incident. Richey’s vehicle was still in gear and rolled approximately 100 yards north on 30th Street before it came to rest against a tree. The officers announced on the radio that shots were fired, that they were being shot at, that an officer was down, and to have two medical squads respond to the scene. Two Omaha Fire Department Medics responded and transported Ezell and Officer Fortune to the University of Nebraska Medical Center, where they are currently being treated for their injuries. Richey was transported to Omaha Police Central Headquarters where he was interviewed by a detective of the Officer Involved Investigations Team. Richey told the detective that he was aware that the unmarked car was a police vehicle. Richey also said Ezell had yelled at him to ‘go’ at the time of the initial traffic stop.